We are in Carmel. I guess it’s really Carmel-by-the-Sea. This is the home of the famous Pebble Beach golf tournament. It’s also famous because this is where Clint Eastwood lives. Yeah, Clint Eastwood lives here. Probably right there. Everything is beautiful here. There’s actually an absolutely beautiful beach here. The Carmel beach with it’s white sand is perfect. 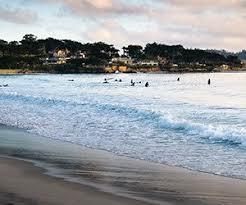 This is the famous Carmel beach. It really is beautiful and right behind us is the Pebble Beach Golf Course. Then, right behind that, are the homes on the beach. This is the kind of town that if you have to ask how much they cost you can’t afford it. But it is a beautiful place to visit. So clearly, we are just visiting. Cause, we’re the kind of people who ask how much things are. These really are some beautiful little beach homes. Well, they are not little for sure, a lot of people have given their homes names here. So right along the side here there’s two homes tucked in this little driveway. One is “Hytide” and the other is “Seamist.” If we win the lottery maybe we will but one. Certainly couldn’t do any worse. My wife and I are just walking around enjoying the sites guess we should get going. We’ve been here a couple of hours but there’s a lot of shopping to do here, lot’s of shopping, it’s just a gorgeous place. So, what do you think Missy? Should we come back at some point in time? So, as we’re driving down the coast, there’s just endless beautiful scenery. So, we just thought we’d pull over for a few minutes and enjoy a little bit of it. It’s really amazing around here. Even the hills. There’s not too much wind so. What do you think, Missy, Missy is a little afraid of heights so this isn’t the best, but. She thinks it’s beautiful. I’m sure. Right Missy should we go down to watch the sunset? What do you think about the sunsets? The sunsets are just absolutely beautiful here. We’re parked right up on the hill we’re just going to watch the sunset and then try boondocking here. There’s no signs up there saying no overnight parking or no sleeping in your car, or no camping. There’s no signs at all so I’m going to try and park here and see what happens. We hope no one comes knocking on the door and tells us we can’t stay here. So I definitely want to try to avoid that. But on the other hand, I want to camp in these spots right here. We could sit here and watch the waves crash across the rocks. We should make, videos of the waves crashing on the rocks at Big Sur. It would probably be a popular video. What an absolutely beautiful place we just watched the sun as it went down with the clouds lighting up. The Sun just went down and the moon is just coming up it’s a beautiful moon. We’re going to go to bed early tonight so we can get an early start. Well it’s been a half of an hour and I’m still sitting here watching the moon, I better get to bed. Missy and I are in Aptos, and there’s a shipwreck here it’s kinda cool. This is the innermost point of Monterey Bay. It is a lot hotter today than I thought it was. I guess it’s 70 degrees but it feels more like 80. There’s no wind, even the breeze off … well there’s no breeze off the ocean. It’s just freaking hot. We are just taking a walk on the beach, we should have worn, short sleeve shirts and shorts and stuff. But nope..